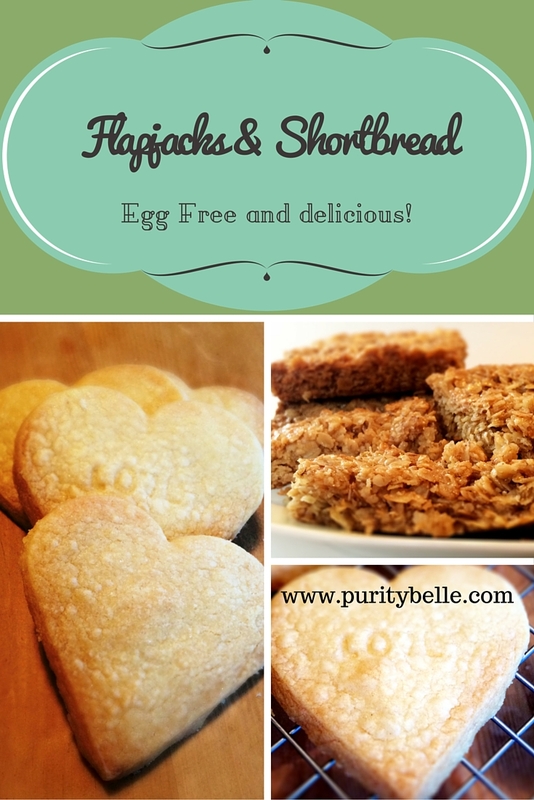 Flapjacks and Shortbread, egg free, nut free and delicious! I had decided to do a lot more baking in the new year, partly because I think the sugar content is so much less if you make it yourself and also because I'm keen to find new egg free/nut free recipes that Izzy (and all of us) can enjoy. The flapjacks I've made a number of times - oats are great for keeping blood pressure balanced and as I've been pursuing a 'healthy heart' diet, they are a good treat for me. The recipe comes from Jamie Oliver's site and I picked it originally because it seemed to have less sugar than a lot of the other recipes I found, and having made them, I'm so glad I chose this one because it's incredibly easy and so delicious. Ingredients are simply butter, sugar, golden syrup and oats - sugar, syrup and butter are melted together and then the oats added (click link for full details). It literally takes about 5/10 min to put together and then pop in the oven for 25 min. You can score lightly when it's still warm and then cut properly when cool. Brilliant recipe for kids to try too as there's really nothing to it! Next recipe I tried - this one for the first time, was shortbread, I really love the buttery goodness of shortbread and again, there's not a huge amount of sugar. Like the flapjacks, the recipe is super easy and comes from the BBC website. Here is the link - Easy Shortbread Recipe. Again, it was very quick to put together - the recipe does say to leave in the fridge for 20 min on the tray before baking so allow a bit of time for this. I was experimenting a little with stamping the biscuits as I had some ideas for a Valentine's blog so you can see how that worked here - the stamp set I bought in Tiger. It worked well although it was super fiddly to get the letters in the right order and I could feel myself rapidly losing patience! Because the biscuits puffed up, the stamped letters faded a bit, I think maybe I'd stamp a bit more firmly next time or do it after they have been in the fridge to see if it makes any difference. You can see below - still visible but perhaps not as much as I'd like. They really taste gorgeous though and again the recipe is a great one for kids to try. I hope you've enjoyed my recipe ideas - as always they are suitable for anyone with an egg allergy and you can substitute a dairy free alternative for the butter to adjust for dairy allergy. These are so super easy which is why I thought they'd be great for kids. My 14 year sometimes does a bit of baking and she loved the shortbread. These look delicious - especially the shortbread! I love the idea of imprinting names into them too. These look delicious. I know my daughter would love to help cut out the shapes and stamp them too - I suspect they'd all disappear very fast once made as well! These sound divine, I like that you are catering to people with allergies too. I have many friends who are allergic to dairy and my best friend is allergic to nuts. He has to carry an Epipen with him. Yum, I love flapjacks and shortbread. Both look good. I've got a 'handmade with love' baking imprint tool and it's great fun. But I like the letter ones too.